I was throwing a leg over a stool at Carroll Gardens' Jake Walk when I noticed a new cocktail on the menu. Set apart from the rest by being framed in a box, it was called the Tequila Gumption, and included reposado tequila, mezcal, maraschino liqueur and Angostura and orange bitters. Below the ingredients was the line "Created by Katie's Boyfriend, Mayahuel, NYC." In cocktail circles, that's fairly easily decipherable code for Phil Ward. Katie is Katie Stipe, a bartender alum of Flatiron Lounge, Clover Club and others. 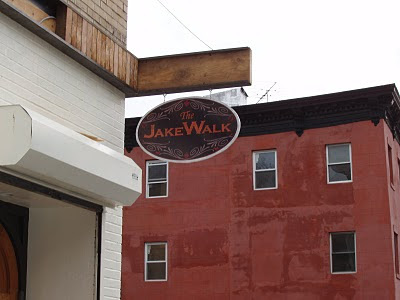 Since it opened two years ago, Jake Walk has established itself as a favorite hang of neighborhood bartenders, Stipe and Ward being among the most loyal. Phil created the new cocktail as a favor to Jake Walk owners Ari Form and Matt DeVriendt. The Tequila Gumption is an unmistakable Phil Ward cocktail, fruity and smoky, with notes of orange, rhubarb, grapefruit, avacado and bell pepper. Close your eyes and sip it, and you are instantly transported from Carroll Gardens to the East Village and Mayahuel. Later that evening, I stopped by Vandaag, the new genever bar on Second Avenue, where Katie Stipe is doing some consulting. Stipe was there, and Phil Ward happened to be hanging out at the bar. I asked them about the Tequila Gumption's amusing attribution. "They said we could credit it any way we wanted," said Stipe.